Scruggs, responding to questions from Centerfolds's lawyer. 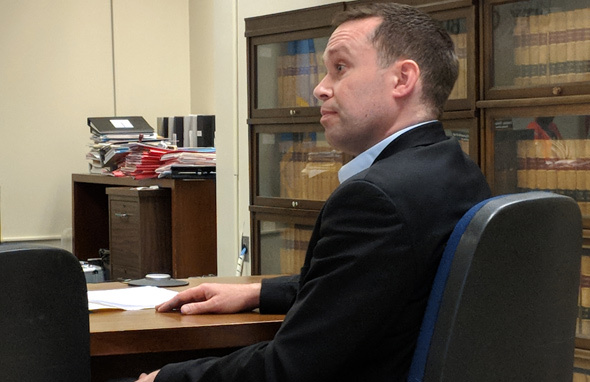 Brandon Scruggs, a Lexington patent attorney, was not ashamed to admit today he was in love with a stripper at Centerfolds on Lagrange Street. But now the Boston Licensing Board, where Scruggs made his public admission this morning, has to decide whether his allegations of illegal dancer touching and heroin use at one of Boston's two remaining strip clubs are valid or whether they're the statements of a bitter, lovelorn man now barred from strip joints across the country. Read more. Tower would replace this thing. 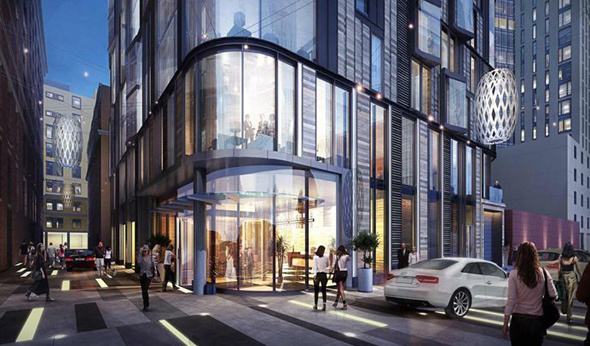 St. Francis House is teaming up with a developer of affordable housing for a proposed 19-story, 126-unit building on Lagrange Street. Read more. The city's last two strip clubs, next door to each other on Lagrange Street in Chinatown, have agreed to make changes in the way they disperse customers at closing time following a 911 call from a nearby resident about the "circus atmosphere" on the small street early one June morning. Read more. Emergency responders rushed to Lagrange Street and Fernwood Road in West Roxbury around 4:50 p.m. after a 34-year-old man suffered major burns on his legs, arms and back at 300 Lagrange St. BPD detectives are on scene and the house has been taped off for their investigation. WBZ reports investigators believe the man set himself on fire and that fireworks are not suspected. 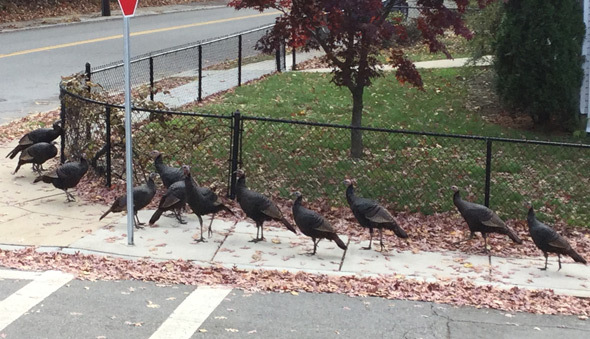 Roving UHub photographer Dave O'Brien came across this rafter of turkeys on Partridge Street at Lagrange in West Roxbury this morning. The Zoning Board of Appeals today approved a local landlord's plans to replace a derelict factory building on Lagrange Street with a 40-unit condo building. Read more. Landlord Michael Argiros goes before the Zoning Board of Appeals on Nov. 1 to seek permission to build a 40-unit, three-story condo building on Lagrange Street near Centre where the old Armstrong asthma-inhaler factory now molders. Read more. MassDOT reports Lagrange Street will be shut just north of Centre Street on Sunday, Oct. 2 to let workers install parts of a new Needham Line bridge over Lagrange. Read more. The Zoning Board of Appeals this week rejected a proposed condo building on the site of a former asthma-inhaler factory in West Roxbury, citing neighborhood concerns about density, parking and the developer's proposal to assemble prefab modular units on the site, rather than hiring local workers for more traditional construction. Read more. 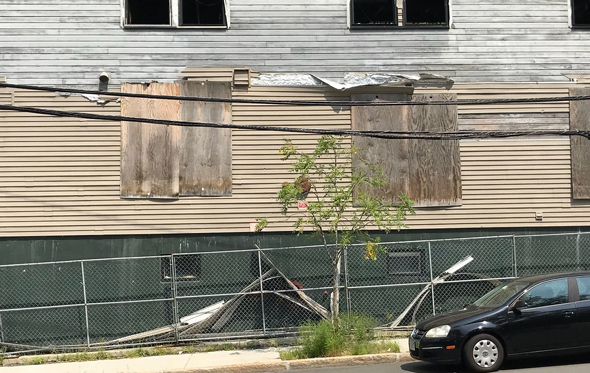 The Bulletin reports local landlord Michael Argiros has revised his plans for the burned-out inhaler plant on Lagrange Street in West Roxbury again; he's now proposing 40 condos instead of 46 apartments. If you're avoiding those stern warnings to stay off the roads, you might want to avoid Lagrange Street in West Roxbury, where a major tree decided to obey the law of gravity in the area of Loyola Circle. And if it had to go down, you know it was going to take wires down with it. Yes, we all get a good chuckle whenever a trucker wedges his vehicle under the bridge on Lagrange Street. But it's frickin' stupid. Read more. 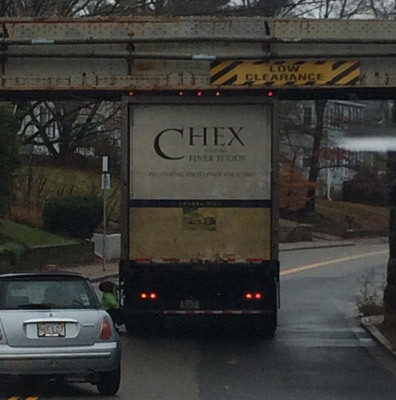 Tim captured the scene on Lagrange Street this morning just after a truck driver discovered one of the two spots in West Roxbury where trucks shouldn't go (the other being the other Needham Line bridge, over VFW Parkway). H/t Paul MacMaster for the headline. Police have blocked Lagrange near Centre thanks to the latest truck driver who tried to go under the train bridge only to learn that, no, they can't and now there's a tractor trailer wedged into the bridge real good.